Google dramatically changed the Google Certificated Educator process this past summer. There are now two levels: Google Certified Educator Level 1 & Level 2. The exams are a combination of traditional questions and simulations. You have to agree to a non disclosure agreement before you take the exams. Due to the NDA, I cannot discuss the questions on the exam. What I will say is that the simulation portion does a fantastic job at evaluating your skill set as it relates to the Google Apps for Education (GAFE) suite. You are supplied with a temporary Google account and are required to complete various scenarios using that account. Some of these are common tasks inside GAFE while others focus on features you may not use as often. The Level 1 exam mostly looks at one application at a time where the Level 2 exam has quite a bit of cross-application integration. You can learn more about the new exams and their format here! Good luck to those of you that choose to pursue this certification. Chromebooks are one of the best-selling education devices in the United States right now. Sales are expected to reach over 7.3 million in 2015. Google Apps for Education is making a huge impact in the way teachers teach and students learn in schools all across the country. Google for Education’s Google+ Group shares ideas and inspirations to over a million followers. Still not convinced? Here are 5 reasons you should become certified in Google’s education suite. The number one reason is to increase student engagement and consequently student learning. Morten Fahlvik, researcher at itslearning, sums up the importance of prioritizing learning. “Technology works only when it’s connected to a desired learning outcome,” Fahlvik says, adding that technology should be left out when its impact isn’t clear. The Google Apps for Education is a great way to increase engagement in the classroom. Grade students’ work and share the results online via Google Classroom. With Google’s products, educators can give instant feedback on students’ work and share grades with selected students for case of group projects. Bruce Wellman, author of Got Data? Now What?, believes in the importance of facilitating data-driven dialogue to measure the impact of school and district. At the classroom level, Google’s data analysis tools can help educators measure their impact and promote collaborative data dialogue. You need to properly understand the tools in order to understand the data. To become a certified Google educator, you must demonstrate ability to use Google Drive, Sites, Gmail and Calendar. Additionally, you must pass one Google for Education elective exam on the Chrome web browser, Chromebooks, Google play for education and Android tablets for education. This allows educators to become certified in their institution’s chosen tools set. In addition to sharing grades online and measuring your impact, Google Apps for Education makes many other things easier, faster and more streamlined, such as assigning individual or group projects to students. Mastering the Google suite will boost your education technology literacy. What’s better? You’ll be able to transfer your education technology skills to students. Thinking of Taking the Leap to Become a Google Certified Educator ? Google is committed to lifelong learning. Motivate yourself to that goal with like minded education technology advocates you will meet in the Google for Education community. Google offers numerous resources for preparing for the certification test. Furthermore, you will benefit from the strong Google Educator Group while preparing for the certification test and build valuable connections. Google offers programs for educators and students. Teachers can share experiences at Google Teacher Academy, a free two-day training for primary and secondary educators. Students have access to internships, scholarships and symposiums in various subjects like science, advertising and marketing, and computer science. If you’re a district or school leader interested in training teachers on Google products, consider bringing a Google for Education expert to your school for a quick overview of what the certification entails and its advantages. 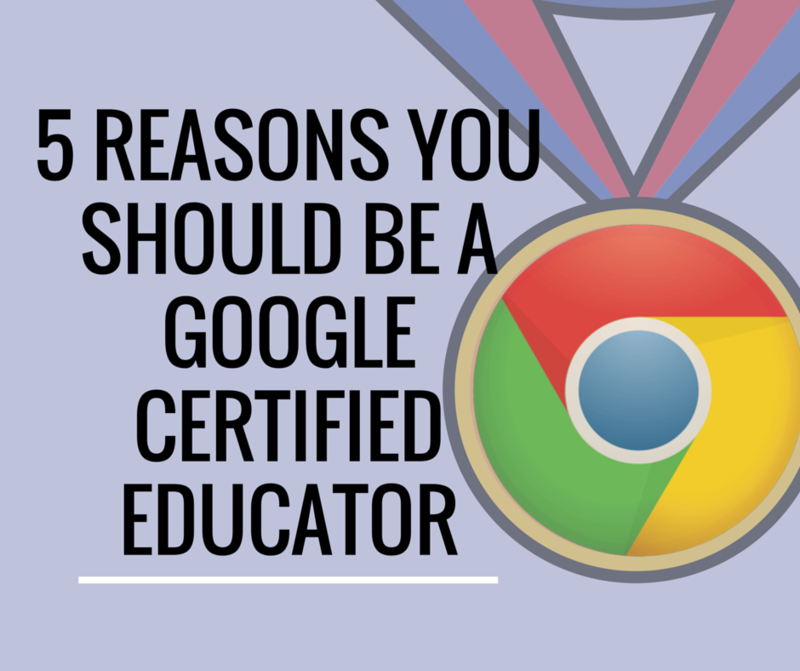 What are some other reasons you should be a certified Google educator? Share your thoughts in the comments below! Great article. I agree with every point. Other reason: Even if you are already great with Google Apps, you will definitely learn more that is relevant and useful.